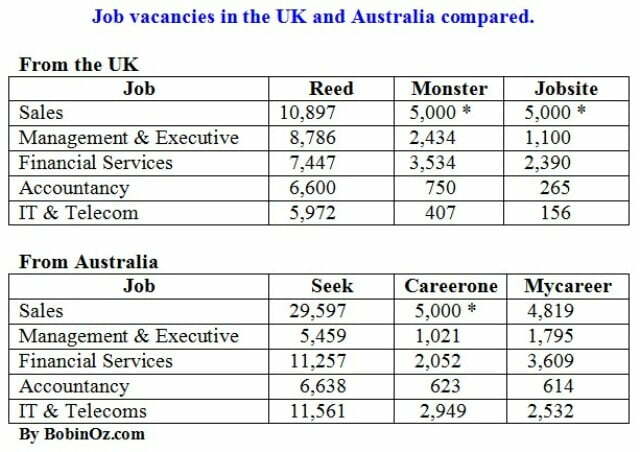 Finding a Job in Australia Compared with the UK. Searching for work in Australia. Like many questions, it’s a moving target. When we first moved here late in 2007 it seemed Australia was in the middle of a big boom. Everyone was busy and there were not enough people around to do the work. This was at a time when I needed tradies, including carpenters, plumbers, plasterers, gardeners, tilers and all sorts to help me sort out the mess that was my new home. It seemed we needed to make six or seven phone calls before we could secure the services of any one trade. Today it is much easier, clearly there is not as much work around. Australia, apparently, didn’t quite go into recession when the rest of the world seemed to. But, generally speaking, workers aren’t so busy today, does that mean there are fewer jobs out there in the market place? So what’s it like to try and get a job? Firstly, if you are not an Australian citizen, then to work here in Australia you will need to be a permanent resident or to have some kind of work visa. Assuming you have one or other, let’s go job hunting. To see how easy (or difficult) it is to find a job here as compared to the UK, I decided to visit the respective countries top online job search agencies. Next, in this super scientific experiment, I locked myself into a dust proof room (as if!) donned my full bodied white protective clothing and started searching for jobs. These extra precautions may sound overcautious, but I didn’t want any more controversy as has happened in other UK versus Australia comparisons. For this experiment I decided to choose the five most popular keyword searches for work and search each website to see how many jobs they head for each. Reed were extremely helpful in this, as their homepage lists all popular keyword searches AND the number of vacancies for each. I ignored Temporary Work Jobs (11,398) and Graduate Jobs (7,855) because, in themselves, they do not represent any particular skill. Okay. The criteria is set and I’m going in! Let’s see what happens. Ok, I’ve finished. Here’s my results. *Both Monster and Careerone (who are in fact the same company, Monster own Careerone) claimed to have 5,000+ jobs for Sales. Yet they each only listed 10 pages with 100 per page, suggesting 1,000 vacancies. Jobsite also suggested they had 5,000 + jobs in sales but only listed 10 pages with 50 per page, suggesting just 500 vacancies. Jobsite defaulted to vacancies from the last 7 days, but as this was the longest period available, we have to accept it’s all they got. For IT and Telecoms, it is best to use Information & Communication Technology in Seek, IT in Careerone and IT and Telecommunications in Mycareer. It is also worth noting that ” Management & Executive” is a term used by Reed to describe a complete category of theirs. None of the other websites had this specific category, so it is not surprising their returns were lower. Remember, these websites act only as agencies, so undoubtably the number of jobs available in each country for each industry is not an addition of each of the three websites. I checked three websites from each country to give a more balanced view. It seems clear that the best agencies in my test are Reed in the UK and Seek in Australia. So I feel you only have to look at the numbers from each of those websites in order to draw your conclusion. I would like to suggest that given Australia has a population of around one third that of the UK and taking into account the watertight laboratory conditions, the results are incontrovertible. Getting a job in Australia is undoubtedly easier, and you’ll get paid more. Well, that’s what I’d like to suggest. But today, I’ll leave it for you to decide. Impossible to estimate anybody’s chances of getting a job in any profession, it really depends how you stack up at the interview. My page Getting a Job or a Sponsorship will help you research how many opportunities there are for what you do though. I am a job seeker for both Sydney and London. I am currently located in India with an active job. Everyday by hunt for jobs in these two countries becomes a bit strenuous. Please suggest me a step by step to get a sponser job in both countries. I am Btech in Applied electronics and instrumentation. 27yrs old and willing to work in any sector except real estate. Hey um living in Sri Lanka. I am a cima finalist and want to work in Australia preferably in the finance sector (currently I do not have any work experience)can u give me some tips to migrate to Australia?? Get work experience in your sector at least 6 months to 12 months, work hard on English skills as this is vital for your application. Good luck. I’m from INDIA and doing graduation here. I want to settle in Australia after completing graduation. Also, i don’t want to continue my studies even there. Is it posible to get a job and PR there ? My uncle lives there and has PR but I’m not interested in his business to get work experience. So anything else that i can do to settle there and get PR ? please help, I’m desperate to settle in Australia. That’s not a question I can answer for you, you would need to speak to a MARA migration agent to find out what your chances might be, or go through my Visa Assessment Service. Next post: What a Wombat! Previous post: Australia is All Spaced Out.